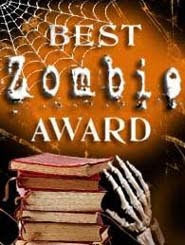 Congratuations to the winners of the BEST Zombie Award 2009! Rather to my surprise, I came home last night to discover the poll had closed with a tie for first place between Vampire Diary by re:paper and Trapped Inside a Haunted House by MyHandboundBooks so the award will be shared this year; however, extra points for re:paper since she was also the 2008 winner, wow! Way to defend your title!! Sara of Re:Paper and Rhonda of MyHandboundBooks are hereby granted free use of the BEST Zombie Award graphics and bragging rights for a full year. In addition, each will receive a special feature here on the blog in the near future. Thanks to everyone who participated in our Team Challenge. And also thank you to the 129 people who voted! One of our commenters has been selected to win a little goodie bag. Random.org selected comment #2 so BookGirl gets the goodies, congratulations to you too! Delighted to win! Looking forward to next year's contest. You guys rock! Sweet, I defended my title AND I get to share it with Rhonda and her amazing Haunted Tunnel book. Thanks!